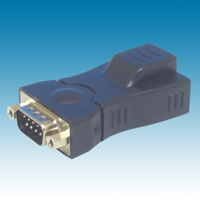 A range of computer, links are available so that the Z88 can transfer data using its RS-232 Serial Port. Communication and file conversion software are needed as well as the cable. The cable that the Z88 uses is electrically different to ordinary PC cables that look the same. We can supply just the cable and an adapter for those users who want to use different programs! The cable that links the Z88 to a PC is not standard. Here are some Mac & PC - Z88 Link programs. This listed Eazylink has now been upgraded to Eazylink2 - it does everything, it is easy to use and it works. BUT people think that I am only saying that because we sell it. That's no longer true, its FREE. So here is your chance to try other programs (Free Link) if you want. Please read details about the Z88 - PC Cable. Click on the link to jump to the application details or the download site for the program. We only support programs that you buy (not the Free ones). If you are having any problems, take a look at our FAQ Page. This page only lists Free Links that I used to be able to run to run on my XP machine. Dennis Gr�ning has listed some more on his site. See Z88 Internet Links. 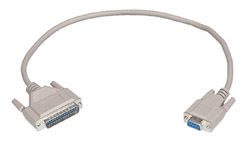 The PC-Z88 Cable used is the one we supply. There is also a free program that runs on RISC-DOS. Catch up with its progress here. It is running on Windows 7 Professional under its Windows xp mode. I have not received any user with the Home version getting this to work yet, perhaps it doesn’t do the job well enough. Most PCs now do not have a hardware serial port. On Windows xp a converter that supports hardware handshaking on the serial port works well. If this converter is moved to a Windows 7 computer the drivers must be Windows 7 compatible and be able to control the hardware handshaking. 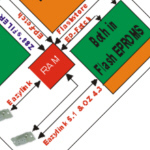 Eazylink is a file transfer program that can send files to and from the Z88 and a PC that is running Windows NT, 2000, 98, ME, XP or Windows 7 Pro with real serial ports (although there may have been an issue with the USB Adapter being used beforehand). It is fast, easy to use and copes with multiple files. v5.1 can Save and Fetch files directly from the Flash file area. - NOTE this is available at extra cost *. and PC program CD disk. You can - Delete, Rename, Send and Receive files, Create and Remove directories in those devices. Select RAM Device (Multiple RAM devices are selected one at a time). Two windows are displayed. One is the Source and the other is the Destination Device. A mirror image of your Z88's file and directory structure is created allowing files to fetched from the database when required. Additional mirror images may be copied, by using different database filenames, allowing different backup versions or backups from different Z88s to be retained. Restoring of files from the Backup Device re-installs original Z88 Date stamps on up-loaded files. 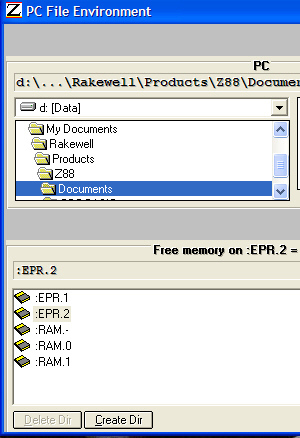 Directories are automatically created by the EazyLink ROM on the Z88 in the RAM filing system. 12 character file names are now supported (unlike PC Link II which only supported the DOS format of 8.3). Using the Commands with the Source and Destination windows, files may be reorganised into different directories within the Backup Device itself. This powerful facility allows the Z88 user to organise files without using the Z88 for the first time. Combined with the Viewer, old files may be deleted or moved to different directories, clearing more space for new files to be created. A text file viewer is included to enable a quick look at files from the Backup Device. Also included is the ability to view PipeDream files in "PipeView," a shareware Windows program from Dennis Gr�ning and a utility which loads or view files straight into the PC PipeDream DOS program. In any of these devices, all devices and directories are displayed and managed using the familiar File Explorer Interface of Windows. EazyLink has been provided with comprehensive on-line help (both as functional reference and context-sensitive help topics). When Cambridge advertised their Z88 - PC Link we all thought it was a lot of money to pay for the cable. I made up a cable and discovered it was not as easy as I first thought. Even now, people are still making the same mistake as I did back then. use the wrong circuit diagram to wire up the lead. There are several of them shown on different web sites. The following conversation was taken off a Z88 site. wanted to do the inverse process for the first time. I wasn't able. I tried the Z88XPort program and the MS DOS command, without good results. The z88 complains about "Poor data received". Have you checked serial settings? Reset turns Xon/Xoff back on, make sure it's turned off. Yes the problem is that I am able to send a file from the z88 to the PC, but not in the inverse direction. As Vic points out it is likely a cable problem. failing when transferring to the z88 ? I'm using a Compaq PC Laptop with Windows98. Z88-Xport needs a working hardware flow control. Z88 RTS needs to be connected to PC CTS. See Help, Cable for the full pin out. Xon/Xoff is ignored so doesn't matter.